Contrary to the claims that armed military officers were not involved in last Saturday’s elections, an independent election observer group, Center for Transparency Advocacy (CTA), on Sunday, confirmed that armed military officials participated in the electoral process in an obvious violation of electoral act. The group said it received several reports and evidences that armed military officers who were supposed to be far away from the election venue left their primary responsibilities and became participants in the electoral process. 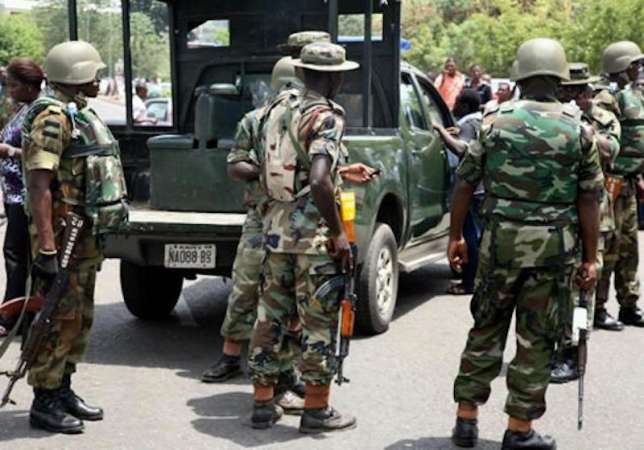 It’s Executive Director, Faith Nwadishi, told journalists at a press conference in Abuja, that the conduct of the armed forces deployed to flash points to ensure the security of lives and property leaves much to be desired. She said: “In many instances, the soldiers practically left their primary responsibilities and became participants in the electoral process. Such incidences were more conspicuous in Rivers, Bayelsa and Yobe states. She said that her team of observers nationwide recorded many other cases of slow response of security officials to security breaches. “This led to situations were citizens were left with no option than to resort to self-help. This is a call to anarchy,” she said. In addition to that, she listed late arrival of materials and personnel, malfunctioning card readers, shortage of sensitive and non-sensitive materials, violence in some states resulting in killings and disruption of voting, missing names of registered voters from the electoral register, poor management of RACS on the polling day, as some of the challenges that questioned the credibility of the exercise. Howbeit, she commended Nigerians who peacefully, painstakingly with determination and enthusiasm came out to perform their civic duties. She also commend Independent National Electoral Commission (INEC) for the simultaneous accreditation and voting which, in no small measure, contributed to the relative success recorded thereof.